Records of Magento customers represent clients of a Magento-based store, for which data is collected within a Magento channel. After the successful synchronization with Magento, the list of customers and their details will be loaded into the Oro application and processed (provided the two-way synchronization has been enabled). If the two-way synchronization has been enabled, you can create a new Magento customer from OroCRM. Go to the Customers > Magento Customers. Click Create Magento Customer on the top right. Channel Choose the channel for which the customer is being created. All the active channels of the Magento type are available. Store Choose a Magento store for which the customer is being created. All the stores available within the channel specified will be available. Customer Group Choose a customer group to which the created customer will be assigned in Magento. All the customer groups available within the store specified will be available. First Name and Last Name Define the name used to refer to the customer in Magento. Owner Limits the list of users that can manage the customer to users whose roles allow managing Magento customers assigned to the owner (e.g. the owner, members of the same business unit, system administrator, etc.). By default, the user creating the record is chosen. Password Define the password for the Magento Customer. You cannot leave the field empty. The rest of the fields are optional. They have been added to the system based on the best Magento practices and keep additional details of the customer (such as the customer’s middle name, birthday, gender, related contact and account). Optional fields may be left empty. Once all the necessary fields have been defined, click Save. Actions that can be performed for Magento customers are described below. Subscribe or unsubscribe the customers to/from the Magento Newsletter: + or –. 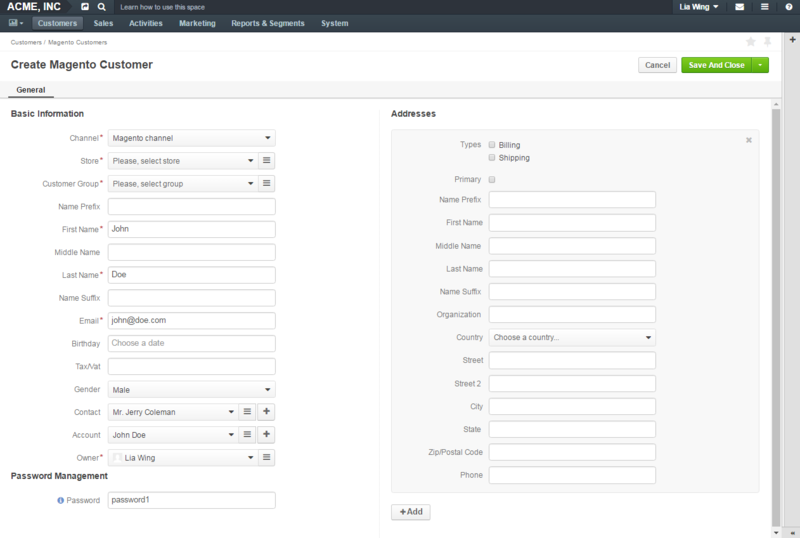 Create an order for the customer in Magento: click Create Order to get to the admin panel and place and order in the Magento store. Subscribe or unsubscribe the customers to/from the Magento Newsletter: click Subscribe or Unsubscribe. The rest of the actions available from the view page depend on the system settings defined in the Communication and Collaboration section of the Magento Customer entity configuration topic. See step 4 of the Create an Entity action description. To select which information to display, click . You can get a quick overview of the products that a Magento customer recently purchased by clicking Sales > Magento Purchases on their view page. Newly purchased products appear on the list when a new order is created. By default, the most recently purchased products are displayed first. Products disappear from the list if an order is cancelled or deleted on the Magento side. You can view credit memos related to a specific Magento customer on their view page. These memos, however, cannot be altered in the Oro application, as they are generated on the Magento side. You can view the comments added to an order by a manager in a Magento store as notes in Oro. Depending on the configuration setup in the course of integration between Oro and a Magento store, these notes may or may not be visible on Magento Customer pages. Please refer to your administrator for configuration details. Page views: Every time a user gets to the page, a visit event is logged. Registration of new users: As soon as a user registers, a registration event is logged. Items added to carts: a cart item added event is logged when a user adds an item to the cart. Start of order checkout: a user entered checkout event is logged when a user starts their checkout process. Order placement: an order successfully placed event is logged when a user places their order.